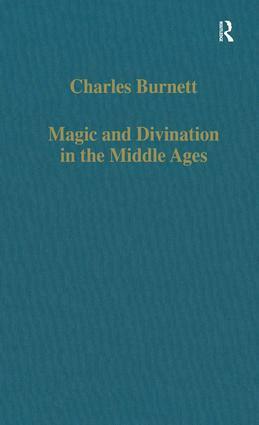 After discussing the terminology of talismanic magic (or necromancy) and its position in divisions of science in the Middle Ages, this book traces the history of talismanic texts from the Classical period through the Arabic world to the Latin Middle Ages. The principal authorities are Hermes and Aristotle, and the search for the ’secret knowledge’ of these ancient sages is shown to have been a catalyst for the translating activity from Arabic into Latin in 12th-century Spain. The second half of the volume is devoted to examples of the kinds of divination prevalent in Arabic and Latin-reading societies: chiromancy, onomancy, scapulimancy, geomancy and fortune-telling. The book ends with advice on when to practice alchemy and a prophetic letter of supposed Arabic provenance, warning of the coming of the Mongols. Several editions of previously unedited texts are included, with translations. Contents: Introduction; Talismans: magic as science? Necromancy among the Seven Liberal Arts; Adelard, Ergaphalau and the science of the stars; Arabic, Greek and Latin works on astrological magic attributed to Aristotle; The translating activity in medieval Spain; The legend of the three Hermes and Abu Ma’shar’s Kitab al-Uluf in the Latin Middle Ages; Hermann of Carinthia and the kitab al-Istamatis: further evidence for the transmission of Hermetic magic; The kitab al-Istamatis and a manuscript of astrological and astronomical works from Barcelona (Biblioteca de Catalunya, 634); Scandinavian runes in a Latin magical treatise; The Conte de Sarzana magical manuscript; The earliest chiromancy in the West; Chiromancy: supplement. The principal Latin texts on chiromancy extant in the Middle Ages; The Eadwine Psalter and the western tradition of the onomancy in Pseudo-Aristotle's Secret of Secrets; Scapulimancy (divination by the shoulder blades of sheep); Arabic divinatory texts and Celtic folklore: a comment on the theory and practice of scapulimancy in Western Europe; Divination from sheep's shoulder blades: a reflection on Andalusian society; An Islamic divinatory technique in medieval Spain; The scapulimancy of Giorgio Anselmi's Divinum opus de magia disciplina; What is the Experimentarius of Bernardus Silvestris? A preliminary survey of the material; A note on two fortune-telling tables; The astrologer’s assay of the alchemist: early references to alchemy in Arabic and Latin texts; An apocryphal letter from the Arabic philosopher al-Kindi to Theodore, Frederick II's astrologer, concerning Gog and Magog, the enclosed nations and the scourge of the Mongols; Index.